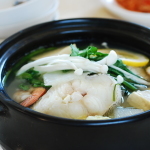 Daegu tang (or daegu jiri) is a mild Korean fish stew made with cod fish and vegetables. Refreshingly delicious! If you think all Korean stews are spicy and pungent, you’re in for a pleasant surprise. 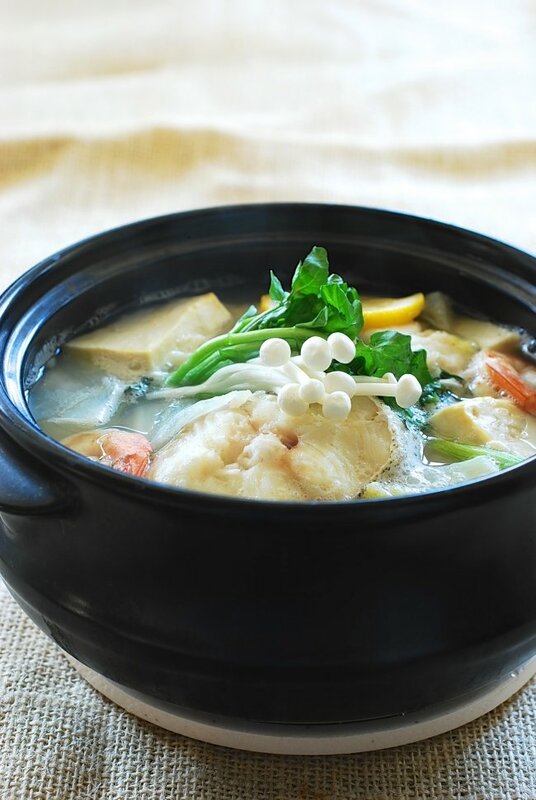 The other day, my husband mentioned that we hadn’t had a fish stew for a while, and I instantly thought of this delicate stew made with cod fish, daegu. I love its subtle yet deep flavor! Cod fish is mild-flavored and has white flaky flesh. 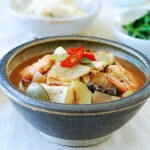 It’s a very popular choice for Korean fish stews. 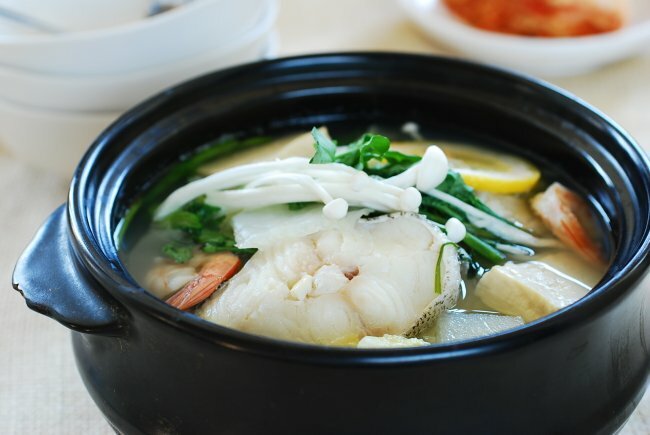 There are two distinct types of stew made with cod fish – spicy (daegu maeuntang) and mild (daegu jiri). Both dishes can be found at most Korean restaurants. Typically, anchovy stock is used for this dish to add depth to the stew. The broth should be light to highlight the natural taste of the fresh fish. Of course, the fish must be very fresh! 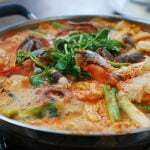 Often, a couple of clams or shrimp are thrown in to add another layer of flavor to the broth. The main vegetables used in this dish are napa cabbage and white radish. You only need a little bit for this dish, so if you have to buy a whole cabbage and radish, use the leftovers for other dishes such as baechu guk and mu guk or namul. 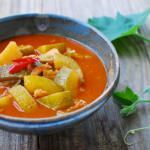 This stew is very refreshing and satisfying! It’s undoubtedly healthy as well. We always enjoy it. Hope you do too! Add the broth to a medium size pot along with the cabbage, radish, ginger, and garlic. Add salt and pepper to taste. Bring it to a boil over high heat. Cook until the vegetables turn soft, about 3 minutes. Add the watercress or crown daisy leaves, enoki mushrooms, and scallions. Turn the heat off. Serve piping hot with the optional lemon slice on top. The soup looks very light and healthy! I love the addition of the lemon slice and I hope I can try this soon. The cod fish (called “tara” fish here) is also common for nabe (hot soup) in Japan, but I never see the lemon addition. Thanks for sharing this wonderful dish, Hyosun! Thank you, Arudhi! Hope you try the recipe and let me know how you like it. I really like stews of all kinds and I can just imagine the amazing, deep flavour here. So fresh! So healthy! Hi Cynthia – Thank you for visiting and for the nice words! It is indeed delicious and healthy. This soup looks amazing. I can’t wait to try it. Come to think of it, I feel that way every time I read one of your post. Thanks for sharing. Thank you, Susan. Try this stew. You’ll like it. I just made this (quadrupled) again yesterday at my in-laws. Everyone loved it! 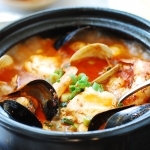 I love Anchovy broth, and this fish stew must be so delicious. I like how simple it is. It warms me up in this cold day! This is a beautiful bowl of stew, Hyosun! That looks beautiful! I must try this! This mild cod fish stew sounds like a wonderful dish. Thanks for this post. Looks really delicious, Hyosun! I love anchovy stock as it is so tasty and the stock can be made so easily. This is just the kind of dish to eat on a cold day. This looks so good! I was actually looking for a dongtae guk recipe (using fresh fish, not the dried)…. I swear my mom used to make it but I couldn’t find anything online. I was wondering if I’m just imagining it or maybe it was daegu and not dongtae? Hi Soyon – Thanks! 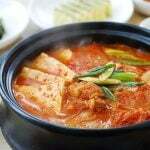 There is such a thing, called dongtae guk (or jjigae) made with fresh pollack. 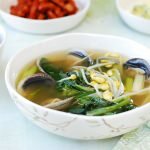 You can use the cooking method in this recipe to make guk (soup). Simply use more liquid and add some kongnamul and/or fully fermented kimchi. My favorite is dongtae jjigae with some kimchi in it. Hope this helps! I have tried twice today (4/30/16) to sign up for your emails but nothing comes to my email so that I can confirm. Your blog is amazing and your food looks mouth watering. Oh nice! 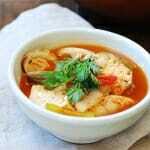 Yes I love this mild, refreshing fish stew too. 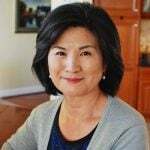 Very glad to hear you make Korean food for your family using my recipes. How nice you make Korean food for your parents! I’m sure they are very appreciative. 1. If I use frozen cod fillets (from Costco), will it still turn out tasty? 2. Will other kinds of fish also work in this recipe? Hi Yuri! 1. Yes it will turn out tasty. The texture of the frozen fish might be slightly tougher/chewier. 2. Any white fish will work for this dish such as flounder, haddock, tilapia, etc. Enjoy!